There has never been anything simple about rugs. Once the highest sign of ostentation and one of the standard units of international trade, the status of rugs has been hit hard in the age of uncritical mass-production – little more than something to wipe your feet on. But now? 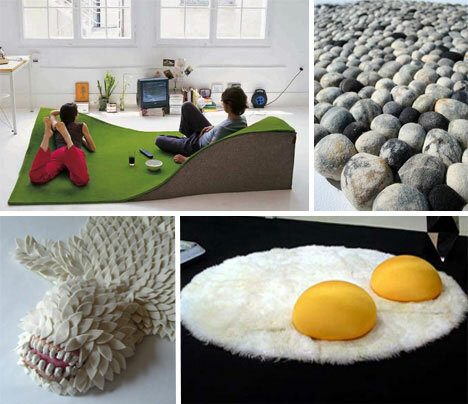 From relaxing rolling terrain to monsters with too many teeth, from snowdrifts to roadkill (and fried eggs on top), rugs and mat designs are enjoying the same creative comeback as any other item of furniture. Which of these 21 examples would floor you? A fascination with the marks left in mud or sand, or perhaps a protest against some very mess house guests? (In the case of the tyre treads, let’s hope the latter doesn’t apply for their sake). Whatever the reason for Amazed‘s design choices in their range of faux marked rugs, they are a fabulous talking point and a terrific gift (say, if you have a budding Leakey in the family). Worried that house guests might judge you on your choice of decor? It might be best to move swiftly past this example (especially if said house guests are committed PETA supporters). 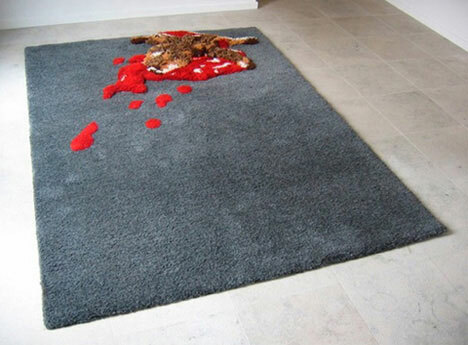 Apparently a symbol of the “continues [sic] struggle between attraction and repulsion”, and with a luxurious square of rich carpet adorned at one corner with a messy depiction of an ex-fox, it’s not hard to see why the Road Kill Carpet will raise eyebrows and possibly a gorge or two. Or perhaps who wish to terrify your guests instead of revolting them. Whatever the Monster Skin Rug used to be when it was alive and whole, you wouldn’t want to meet one in the wild. This luxurious item made (from cashmere) hides its sophistication behind a mixture of wit and palpatation-inspiring intimidation. 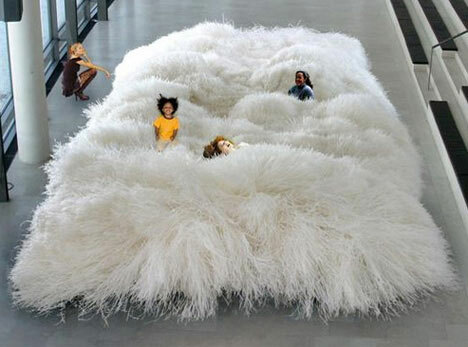 We’re not convinced the above image hasn’t been Photoshopped, but we’re fully behind the concept for the Dialogue Carpet – made of paper yarn, it can swallow you whole (in the nicest way, as opposed to the Monster Skin Rug). If you like the idea of getting home from work and hurling yourself into the depths of something more like a fairground attraction than a piece of everyday furniture, this is exactly for you. We cannot make our minds up whether the LASA felted marino yarn rugs remind us more of something from the deep blue ocean or our favorite candy store. Coming in a range of colors, they look comfortable, stylish and, well, more than a little alive. 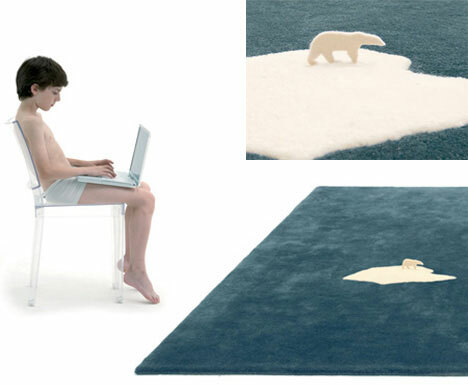 The message behind the plush Global Warming Rug is clear – our world is changing, and we don’t want to be caught unawares. If the raised felt polar bear is us, where would we go? (For those prone to investing animal-shaped objects with their sympathies, don’t worry – polar bears are great swimmers). And in a similar design vein, the Iraq Carpet has a similarly unambiguous symbolism (albeit in this case, rather blunter). 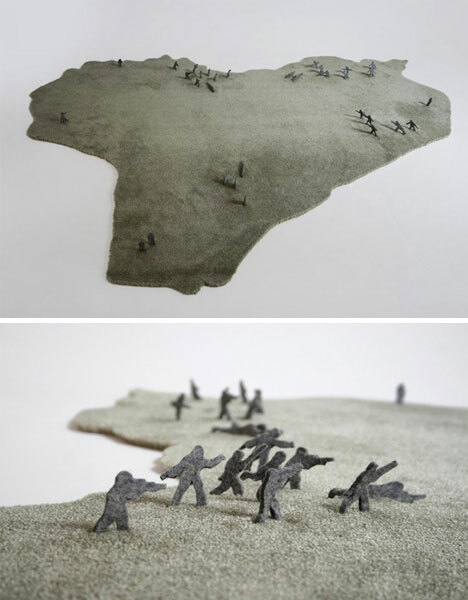 Felt figures swarm across the outline of the most famous Middle Eastern “active theater of combat” in recent years, some ominously flat on the ground. House guests have family in the Armed Forces stationed abroad? Hide this one in the loft-space until they’re gone. 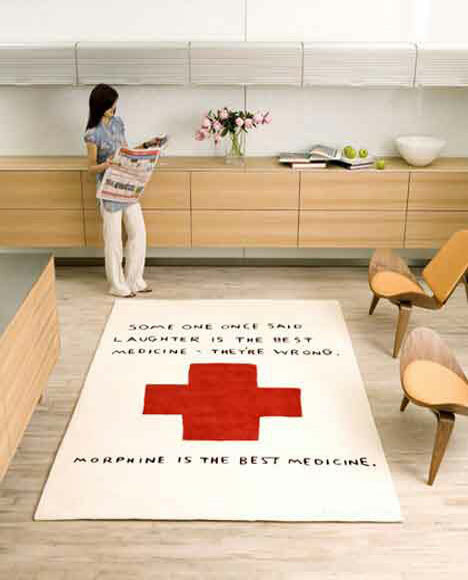 Morphine may be the best medicine, but laughter’s a close second. Dispensing dire warnings and political commentary is all very well, but it’s not guaranteed to cement your reputation as Fun To Be Around. 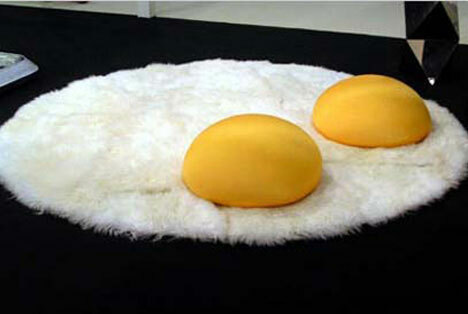 Rugs that make you giggle? They will do the trick nicely, as designer Dan Golden obviously appreciates. 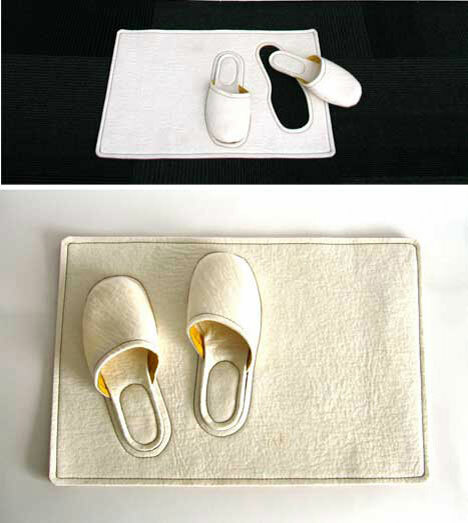 Of course, another way to woo visitors is to have the comfiest rugs in the neighborhood. 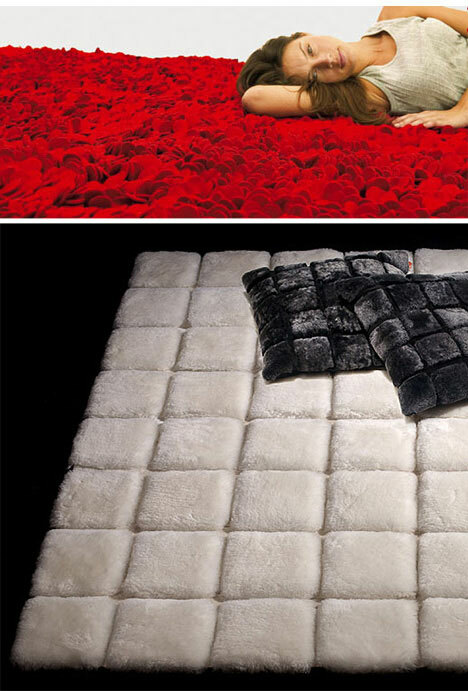 Two suggestions are the American Beauty style opulence of the Roses Rug, which uses felt wool to fabricate the appearance of a bed of rose petals. Or maybe the luxury of this sheepskin patchwork, which looks terrific even before you hear its name: Chocolate Blocks. (If the designers made it smell like chocolate as well, they would be fighting off customers with a big stick). Poaching an idea from your breakfast table, the Sunny Side Up rug looks good enough to eat – but it’s a little odd as a choice for a rug design? Ever felt like stretching out on an enormous double-yolked fried egg? Quite. If you can get past the slightly peculiar vibe, those yolk cushions (belay your worries of puncturing them) would be great as elbow rests. Moving out of the frying pan, we have another rug that pretends it is made from a less-than-comfortable material – in this case, bare rock. 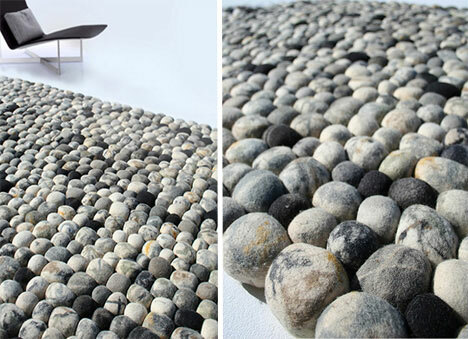 2Form Design’s Pebble Rug is nothing of the sort, being made of an array of wool balls decorated to look like stone. Ideal for those who want the natural look in their home but are unwilling to stint on comfort. Increasing the scale somewhat, here are two rugs that take a bird’s eye view. The Carpet Rug (the name might need a little work) is a series of different-colored ployurethane columns that viewed from standing-height appear to form a relief landscape. Seyed Alavi’s Flying Carpet – which you can see at Sacramento Airport – foregoes suggestion in favor of reality. Walk the length of it, and you “fly” the length of the Sacramento River in aerial photography. 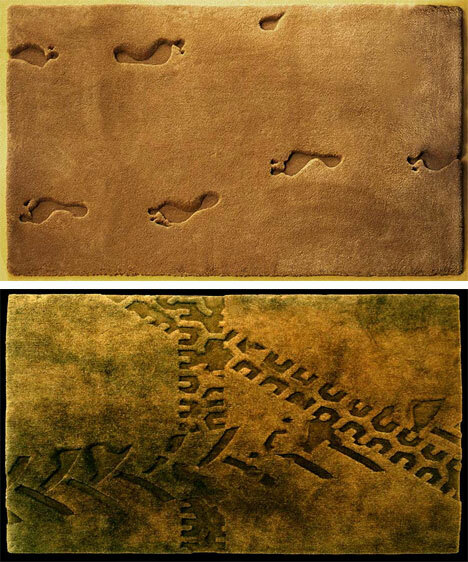 Also carrying the name of Flying Carpet is this topographical marvel of a rug from Nani Marquina. 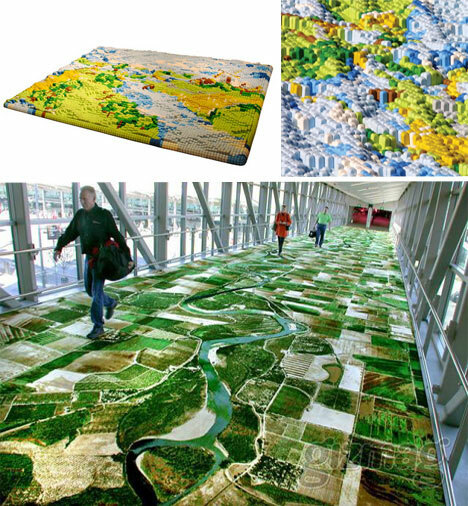 If you are looking for a floor-covering that simulates your favorite patch of local parkland, grassy knolls and all. 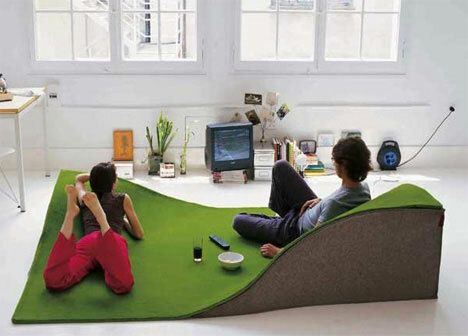 It’s an ingenious halfway-house between a rug and a beanbag seat – and we’d like the designers to blur the lines even further by releasing aversion with deformable curves, so you can mould your own terrain…. …although maybe this is taking the idea a little too far. 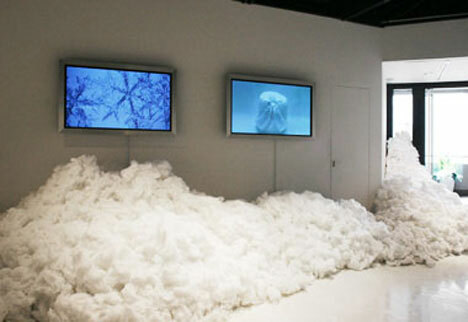 The Snowflake rug looks like an Australian farm on sheep-shearing day – in fact it’s formed of transparent plastic fibers woven together to simulate a snowdrift. The result is chaotic, billowing, artistically untidy-looking, and probably enormous fun. Boy racers, your time has come. 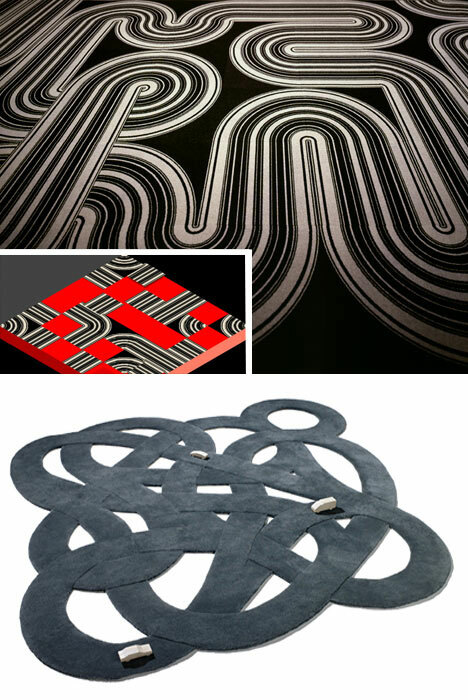 Seemingly created with Scalextric firmly in mind are two rugs designed to drive you round the bend. Big Game’s Miles rug is a spaghetti of a freeway interchange from which there is no escape (you can test this out using the wooden cars that come free with it). For more creative control, the RacinTrack modular system is a series of tiles that you lay down, Pipemania-style, to form your chosen route. Solving a centuries-old problem is this impressively piece of technology going by the name of Sajjadeh 1426. 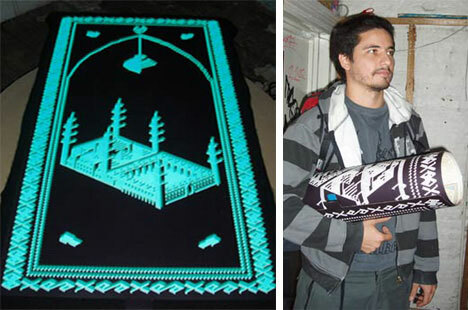 It’s a sophisticated electro-luminescent prayer mat with a design that glows brightest when the head of the mat is pointing towards Mecca (courtesy of a built-in compass and GPS).